NOT thrips. That’s what Kerry Siders has concluded about damaged leaves found in some Texas Plains cotton. When is a cotton plant like a piece of bologna? Read more of Kerry’s comments below. BUT there are plenty of thrips still on the attack, especially in the South Plains and the Panhandle, so scout carefully. Slow plant emergence means seed treatments may run out of gas and foliar insecticide treatments will be needed. Stinkbugs and worm egg lays are showing up in our southern coverage area as cotton blooming advances. Assassin bugs are among the predators helping eliminate bad bug populations in the Lower Rio Grande Valley. Rain is needed across much of West Texas, the South Plains and the Panhandle. Many fields were dry planted to meet insurance deadlines. Century mark temperatures are adding more pressure to early plant growth. A slow start has some Kansas and Oklahoma growers worried. Rain is needed to regenerate plants that faced a cool, damp start. Eastern New Mexico needs rain, while Arizona farmers are irrigating hard and heavy. Check out our News Links and Upcoming Events section below. Got a field day coming up? Send your details to beef2lar@suddenlink.net or call 806-671-1446. 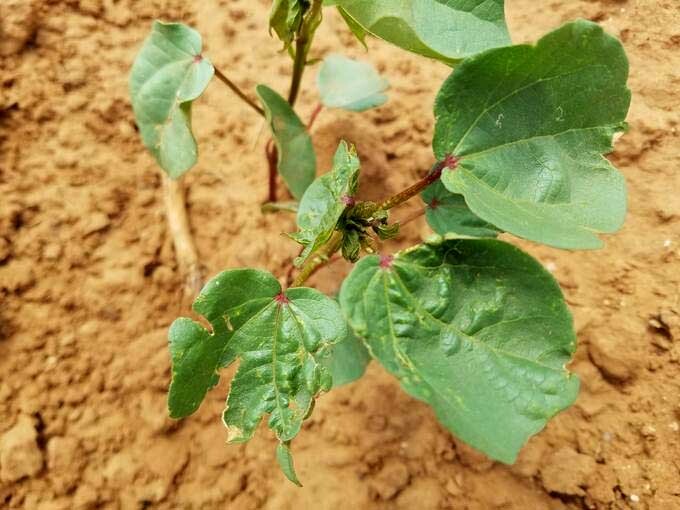 Kerry Siders, Texas AgriLife IPM agent, Hockley and Cochran Counties: “This week’s excessive heat, high winds and the lack of rainfall are causing young cotton plants to pucker as if they were under attack by thrips. Some growers fear it’s thrips damage, but we’re not seeing the telltale sign of damage on the underside leaves. “The cotton plant is hardy, but it’s a tropical plant. If young plants are in an open field and are hit with high soil surface temperatures, they can’t cool themselves. It’s like frying a piece of bologna in a skillet, where it cups up once it hits the hot surface. The hot desiccating winds are causing plants to grow abnormally. Plants will continue to grow as long as we have soil moisture, but will be damaged by the hot surface. It could hurt small squares. We’re not seeing this where center pivots have cooled the surface or a rotary hoe has broken up the velocity of the hot wind. But subsurface drip growers could see damaged plants because there is no surface water. “Growers can expect to see damaged plants until temperatures drop or we receive good rainfall. Even with this damage, it doesn’t excuse people from scouting for thrips. If you question it, get with a professional, someone from Extension or a consultant. This crop needs all the help it can get.” Scroll down to AgFax News Links for Kerry’s blog and more photos. Cotton leaves damaged by heat and wind. Rex Friesen, Southern Kansas Cotton Growers Co-op, Winfield: "Our crops should all be in the ground, although some growers may try to double crop after cutting wheat. The cotton is not off to a uniform start. Emergence has been hampered by the cold weather in May, which held it back. The crop has not had an easy life but it’s coming along. The warm weather we’re seeing now will help. We have good soil moisture so we hope to see some vigorous growth. Ed Bynum, Texas A&M AgriLife Extension Entomologist, Amarillo: “Seed treatments are likely playing out on late plantings and also cotton planted north where cooler nighttime temperatures slowed down emergence. The treatments won’t be effective against thrips, so farmers need to be scouting and then use a foliar insecticide application, if needed. “Thrips could be heavy north of Amarillo because wheat has been delayed and just now drying down. Hopefully, the cotton will be far enough along to withstand damage from thrips leaving wheat. But if cotton was already damaged, there could still be problems. “Grasshoppers are building up heavily in the northwest Panhandle and parts of the eastern Panhandle. Some farmers are already spraying for them. It’s so dry and grasshoppers could start moving out of pastureland to crops, which could be a problem. “We’re starting to see some spider mites move out of wheat and into corn. The hot, dry weather will promote a mite population buildup. We may get some relief from mites because western fly thrips are moving into corn. They can damage leaves, but will also eat mites and are good predators in corn. When they disperse we could see mite populations build up again. Clyde Crumley, Crumley Agricultural Consulting, El Campo, Texas: “It’s hot and humid and things are moving right along. The last rain we had was 10 days ago and totals varied from 1 to 4 inches. We’re fighting to get caught up with fieldwork. Growth is from 4 true leaves to the third week of bloom. Some bolls are sizing up and we have good control on weeds. “We still have fleahopper issues and older cotton is starting to see stinkbugs move in. About 75% of the issues are with brown stinkbugs. We’re actually ahead of the curve in controlling them because growers are staying on the ball and making timely treatments. But stinkbugs are just insidious. They’re difficult to scout for. You can have an infestation 100 yards away and not see it. To do a good job of scouting stinkbugs you have to crack bolls to see how many punctures they’ve made. “We’re also on the leading edge of a worm egg lay. It’s nothing serious yet, like last year at this time when we had tremendous egg lays that hit us straight in the face. Still, if you’re not looking for eggs and worms you need to be. “Our sorghum is fantastic. We had timely rains and a great grain fill. Further south toward Corpus they’ve had to treat for sugarcane aphid. We’re not seeing those, but we are seeing headworms as well as armyworms in sorghum. Suhas Vyavhare, Texas A&M AgriLife Extension Entomologist, Lubbock: “Thrips pressure is starting to hit some regional farmers. It is not bad in the Lubbock area, but farther north in Swisher and Hale counties, pressure is at 6 to 7 thrips per plant. Seed treatments have done a good job, but with heavy infestations treatments will be needed. Gaylon Morgan, Texas A&M AgriLife State Cotton Specialist, College Station: “Things are looking good in the Upper Gulf Coast after the good rains we had week before last. Saturated conditions have gone away. Things are also progressing in the Blacklands. The latest planted cotton is at match-head square, so guys need to beware of the potential for fleahoppers. Earlier cotton is flowering and looking good in the Brazos Bottom. “I suspect stinkbugs will continue to be a concern in the Blacklands, especially as sorghum progresses and dries down. Weed control remains good. There were probably some flushes after this past rain, but overall it looks like things are holding fairly well. Joel Webb, Texas A&M AgriLife Extension IPM Agent, Runnels, Tom Green & Concho Counties: “It remains dry in the Concho Valley. We’ve only had spotty precipitation. Our planting deadline is June 20 so we hope to finish planting in the next week. Right now more than 50% is in the ground, but there is very little 2- to 4-leaf cotton up. Chris Locke, Sudan, Texas/Eastern New Mexico: “I’ve had some rain on my personal crop but I’ve been fortunate. There are big areas with no rain at all. Everything is planted, but there could be more dryland planted farther south. Overall, plant growth is anything from just breaking the ground to 4 true leaves. “Thrips pressure is pretty heavy and grasshoppers are starting to show. 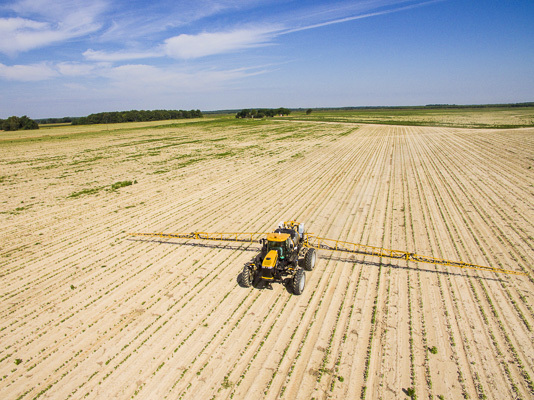 Farmers will need to include an insecticide treatment with their herbicide applications. Weed pressure is light thanks to a good preemerge program. Dicamba acres are way up and seem to be working well. Seth Byrd, Texas A&M AgriLife Extension Cotton Specialist, Lubbock: “We need rain badly. Scattered showers have helped some, but we need a good general rain over the whole South Plains area. Most folks are close to being wrapped up with planting. There are probably some replants being made and a lot of cotton went in the ground dry. Chuck Wilbur, Independent Crop Consultant, Wellington, Texas/Southeastern Panhandle/Southwestern Oklahoma: “We haven’t had rain in weeks, other than a few popcorn showers here and there. It’s maybe 0.20 of an inch in the last 40 days. About 75% of the dryland was dusted in by guys hoping for rain and they’re still waiting. “The irrigated crop looks good. It’s anywhere from 3 true leaves to pinhead square. A lot of herbicide is going out, mainly burndown and residuals. It seems like the dicamba treated cotton is holding up well. “Irrigated farmers are starting their second pass of nitrogen application through the pivot. Thrips were a problem last week but they’re hit and miss now. Younger cotton will need a treatment, but older cotton is probably far enough along to withstand thrips pressure. Shane Osborne, Agronomist, Western Equipment Co., Altus, Oklahoma: “Cotton has had a rough start. Guys who were intent on planting in less than ideal conditions early on are having trouble making good stands. Also, a lot of varieties we saw last year that made good yields don’t seem to have good seedling vigor this year. All this has cost us a little. We’ve had some successful replanting but also some troubles with weather. “Cotton that survived early conditions is taking off. It has good yield potential. But some of the replant cotton is up against the wall. On a positive note we still have a good soil profile but need rain to provide good yield potential. Randy Norton, University of Arizona Extension Cotton Specialist, Safford: “It’s very hot and a lot of irrigation water is going out on a lot of cotton this week. Most farmers are applying their first post-plant irrigation. It’s a critical time to set up fields for a good crop. “In the west we’re approaching peak bloom, while the crop is just starting to bloom in central Arizona. Eastern cotton will be blooming in about 7 days. There is also some small cotton here and there where guys got planted late. Danielle Sekula Ortiz, Texas A&M AgriLife IPM Agent, Weslaco/Lower Rio Grande Valley: “Cotton is looking good and we have a lot of bolls that are already pretty mature. We could see early harvest begin in mid-July. “We are watching for tarnished plant bugs. Populations aren’t high, likely due to our hot, dry weather with a heat index near 110. But if we get a rain on late cotton, treatments may be needed. A few Verde plant bugs, stinkbugs and white flies are being seen, but thankfully we have a lot of predators out there. Lady beetles, pirate bugs and assassin bugs, which resemble plant bugs, are helping hold down insect problems.